Imtech N.V. (technical services provider in Europe) is acting as technology partner of PlanetSolar, a solar energy powered ship. In 2011, PlanetSolar will set sail on a world cruise of approximately 50,000 km, with the aim of promoting solar energy and the use of environmentally-conscious alternative fuel for sailing. PlanetSolar is a high-tech 85 ton, 31 meters (101.7 ft) long and 15 meters (49.2 ft) wide catamaran, covered by 537 m2 of solar panels. 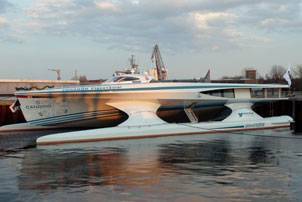 The futuristic-looking ship is powered by two 10 kW electric motors. On board it has the world’s largest lithium-ion battery, with a power storage capacity of 2910 Ah and a weight of 11 tons. In total, PlanetSolar can travel 1,000 km without sunlight. PlanetSolar has a top speed of 14 knots (25 km/h) and can house around 40 guests. It produces zero environmental pollution and the ship moves noiselessly. The Knierim Shipyard together with HDW constructed the ship in Kiel, Germany. PlanetSolar is an initiative of Swiss national Raphaël Domjan, president and skipper of the ship. Jean Verne, the great-grandson of Jules Verne is one of the project’s “godfathers.” This is the first ship to undertake a cruise around the world powered entirely by solar energy. The 50,000 km journey is expected to take 140 days at an average speed of eight knots (15 km/h). The planned route is via the Atlantic Ocean, through the Panama Canal, across the Pacific and Indian Oceans, and home via the Suez Canal and the Mediterranean Sea. “Energy Consciousness Stops” will be made amongst others in New York, San Francisco, Darwin, Hong Kong, Singapore, Abu Dhabi and Marseilles. Imtech is acting as technology partner on PlanetSolar and is responsible for the project management, engineering, implementation and commissioning of the high-tech energy distribution system, the technology that provides for charging the lithium-ion battery, the alarm & monitoring system and the cable system. Imtech also provided a large part of the “green” technical infrastructure on board the Rainbow Warrior III, the new flagship of Greenpeace. In the U.S., Imtech is involved in an ecological sightseeing boat powered by a combination of solar energy and sustainable electrical propulsion. Together with Feadship (designer and builder of luxury yachts) and MTU (builder of ships’ engines), Imtech is researching the possibilities of constructing “green” luxury (mega) yachts. Recently Imtech has also developed a “smart battery concept” for the long-term distribution of energy on board ships.